PFB Cupid Postcard – The Last One! I was sooo excited two weeks ago. 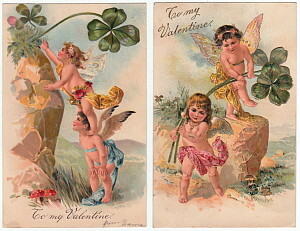 I had found the 6th (and final) antique cupid postcard in a series published by PFB! Granted, three of the six weren’t brilliant (gold trim). I was still very happy to know what the image was on the last postcard to find. It was of a cupid with fairy wings standing on the shoulders of another cupid with bird like angel wings trying to reach a clover on a small rock cliff. So darling! 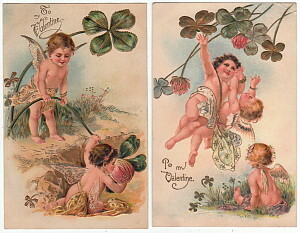 I have posted images of all six antique postcards for my blog’s readers. Enjoy these treasured members of my personal postcard collection! If anyone knows who the artist is for this series, I would be interested to know. What I’m curious about is the type of machine Anna wants sent thru the mail. The time period and gender of the sender suggests perhaps a sewing machine. However, peddle sewing machines were quite large. Was the post office in 1908 equipped to mail an item the size and weight of a sewing machine? Could there be another machine small enough to mail thru the post office? What do you think? Be sure to stop back on August 16th when I share an exciting find for my personal postcard collection. Ever wonder what became of the buildings on old vintage postcards? Are you curious to know if they still stand? In my previous blog post, I showed two hotels; The Elms Hotel in Excelsior Springs, MO and The Durant Hotel in Fling, MI – Hotel Old Vintage Postcards – Then and Now . I continue my series of blog posts on “then and now” old buildings pictured on vintage postcards with the below sanitarium also known as Hell House. This building had originally been a sanitarium for rheumatoid arthritics in the early 1900’s. People took mud baths in mud from the nearby sulfur springs in hopes of relief from pain. When this went out of style, it became a monastery. Prior to this suspicious fire in 1997, it still looked very depressing (inside and out). Yes, the floors were unsafe and there was a hole in the roof from a previous fire, but I don’t believe it would’ve been considered a complete tear down. As for the Hell House designation… At some point after the building was abandoned, someone had painted “hell house” across the top of the front. Kind of fits as the building does look creepy. Be sure to stop back on August 12th, when I share a curious postcard message. I was sooo excited to buy several Halloween postcards for listing in my web store at the recent 2011 Land Of Lakes Postcard and Paper Show. One was of a witch sitting on a moon with a white owl. Such a striking image. I was curious what an owl’s connection was to Halloween. I found a blog post entitled Birdlife: Spooky Myths About Owls that explained the connection. I thought you might find it interesting. Be sure to stop back on August 8th for the next installment of “Then and Now” Postcards. It was a sad ending for the featured building. I came across a special vintage patriotic postcard with a type of postmark I had heard about, but not seen. 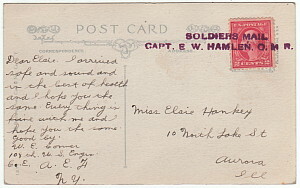 The postcard was hand stamped “Soldiers Mail, Capt. E.W. Hamlen, O.M.R.”. Below is a picture of both the front and back for those who havenot seen this type postmark. 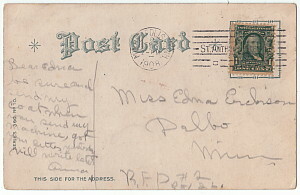 The above postcard, with soldiers mail hand stamp, was sent by W.E. Conner of the 108th U.S. Engineers. W.E. writes that he arrived safe and sound (doesn’t mention where), and that everything is fine. I imagine this news was a great relief to the recipient, Miss Elsie Hankey. I just had to laugh recently as I took a trip down memory lane. I ran across a MSN Money article, http://tinyurl.com/3jhwauv , about a man who got cited for disorderly conduct after paying a $25 medical bill with pennies. I once did the same thing when paying a $20 spa bill just out of high school. The spa said I owed, I said I didn’t (I’d canceled my membership the previous month.). The bank almost didn’t give me the pennies as it would severely deplete their supply (or so they said). I dumped a coffee can of unrolled pennies on the receptionist’s desk. Hah. The article goes on to list several examples of the same type of protest. I’m surprised in today’s economy that more people don’t protest in this manner. At the end of the article, it explained US law states a merchant does not have to accept over 100 pennies as payment. I didn’t know that. Good thing the spa didn’t know either, wink wink. I ran across this beautiful poem on the back of an embroidered silk vintage birthday postcard in a lot I recently bought. Enjoy! 1915 Embroidered Silk Birthday Postcard, made in Germany. “…Your Birthday is never forgotten, neither are you. And this little card brings with it a greeting true. For those of you who celebrate your birthday this month, Happy Birthday! ** This and other vintage birthday postcards can be found in my store, Remember When Vintage Postcards. 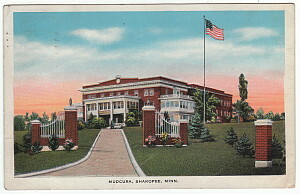 Also, we post a picture of an antique or vintage postcard’s back when listing it for sale. If curious, stop by for a visit and browse our postcards to see what was written on their backs.